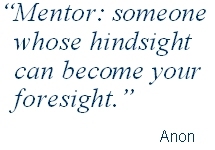 Mentoring describes the assignment of a specialist to help individuals develop their skills and apply them effectively. Mentors have practical, in depth experience of a particular role or roles and help team members avoid the many pitfalls which can occur when adopting new tools and techniques. Coaching in the use and application of the development process. Hosting workshops in which project artefacts are produced as worked examples. Guidance in the use and application of the software development tools used by projects. Matching individual development with project imperatives. Mentors work within an overall plan which defines standards, policies and objectives. Although mentors have extensive skills as practitioners, they are also expert in transferring those skills to others effectively.